Lots of traffic through my neck of the Glidden Sub today, but clouds and oppressive heat kept me indoors for most of the day. 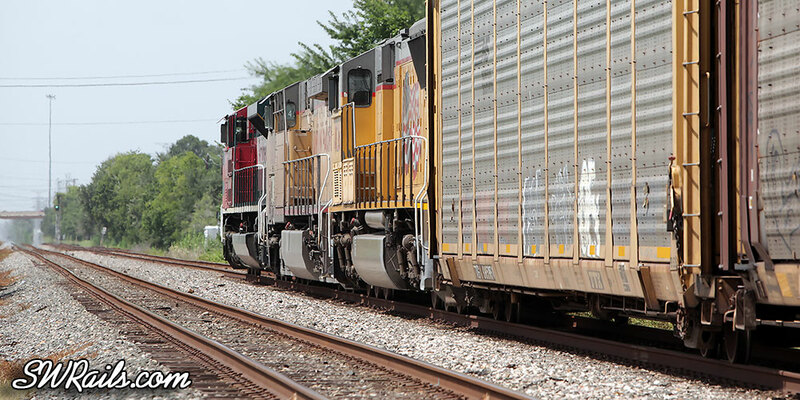 My reluctance to venture out was tempered when I heard the DS talk to FXE 4031 on an ALDLI (Autos Laredo-Livonia) train. 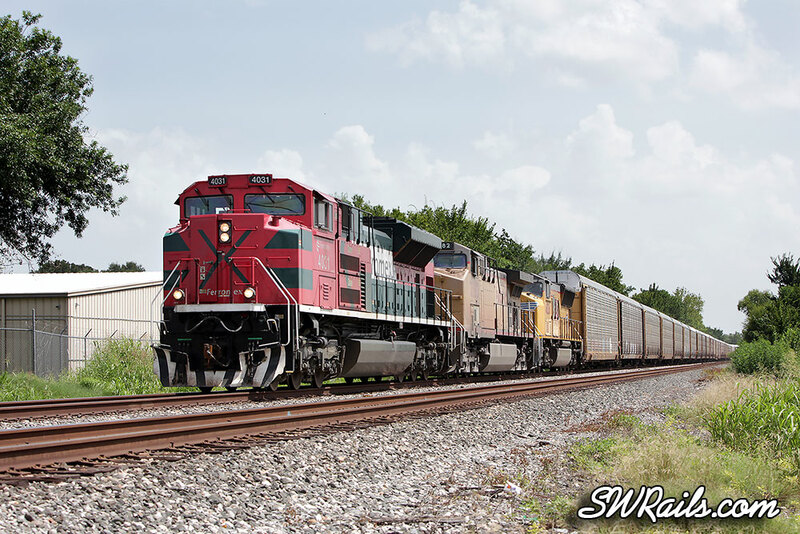 I initially heard the DS talk to the ALDLI around mid-day, telling the crew that they were pretty much stuck in the Rosenberg siding until terminal congestion cleared up. It wasn’t until 1445 that the train finally got into the Sugar Land area, too late for anything than a very back-lit shot around here. 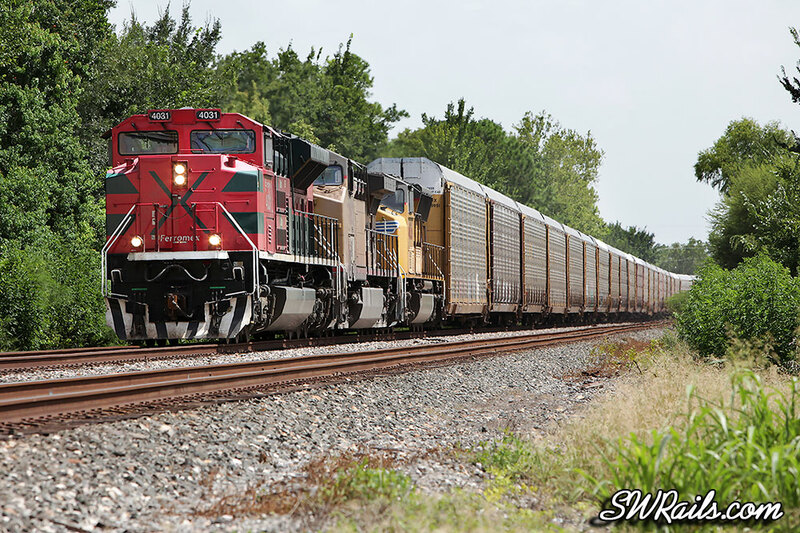 I ended up driving to Willowbend Drive in Houston, where the track turns to the north, in anticipation of better light on the FXE 4031. I’m not crazy about the white sky in image 1, so I did a bit of work on image 2 to see if I could get a better rendition of the sky. It does look a lot better, but I’m still partial to the deep blue winter skies. There were 2 trains following the ALDLI, but gnarly clouds were rolling in, persuading me to start the 12 mile journey back home. Wouldn’t you know it, i photographed this same train the morning of July 27th on its last leg of its trip to Livonia! By the way, i love all your photographs and the storys along with them! Thats a cool coincidence. Here’s a link to your photograph: http://www.flickr.com/photos/76207783@N03/7655905242/in/photostream. PS- Thanks for the nice words!